I had the pleasure of meeting Christina and Brandon a few months ago. 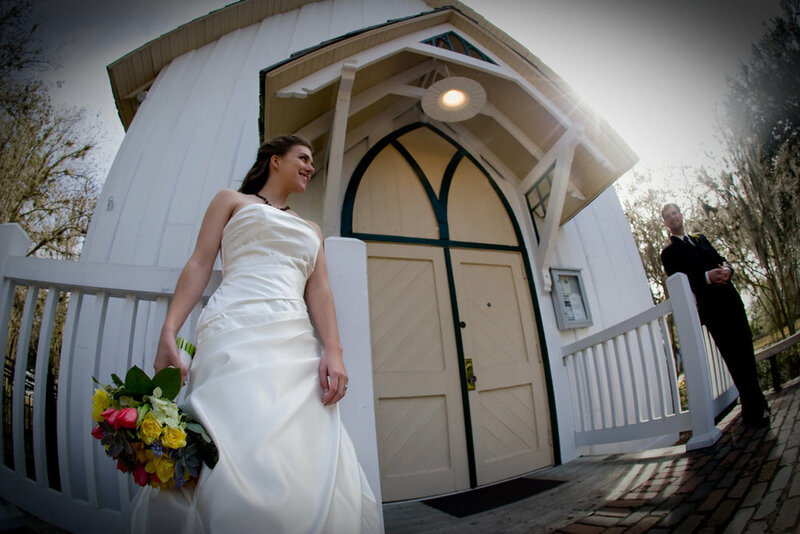 They had their venue, San Marco Preservation Hall, booked - and knew they HAD to have MoJo BBQ for the reception! Christina also had some ideas on decorations, but needed help pulling everything together. Having both ceremony and reception at San Marco Preservation Hall meant that we needed to bring in everything we needed for the reception - tent, tables, chairs, linens, service staff, and everything in between. We called Kirby Rental to handle most everything we needed, and booked service staff from Hospitality Staff. Since February weather is so unpredictable (especially this year! ), we rented outdoor heaters from Rollin' Ritas, and we certainly were glad we did when the wedding day high was 52 degrees! Christina wanted an upscale-barbecue feel for the reception, so we chose brown pin-tuck linens with celedon green napkins. Her centerpieces were adorable - Mason jars filled with succulents created by the bride, and fresh, loosely arranged flowers by Anything With Plants. Christina and Brandon didn't want the traditional DJ and dancing that we see at most receptions, so they opted to have their favorite trivia host provide entertainment. The cake fit their lemon theme perfectly - Classic Cakes created a lemon cake with fresh raspberry filling that was to die for!